Sabering champagne is cool and all, but if you really want to look like a badass at your next dinner party, try using Port tongs to open a bottle instead. Invented in the 18th century, Port tongs are essentially long-handled tongs that close around the neck of a wine bottle. They’re heated over a flame until they’re red-hot and held around the neck of the bottle below the cork. Then the tongs are removed and something that’s been dipped in cold water—this could be anything from a cloth to a feather—is held around the neck in the same spot. The temperature change causes the glass to break, and the whole top part of the bottle, cork and all, can be removed. After the neck of the bottle is removed, the wine is decanted through a filter. Since this method was invented for older bottles of Port that often contained quite a bit of sediment (that gunk that collects at the bottom of bottles of red wine as they age), the filter was necessary to make sure none of those bits of sediment landed in the glass of whatever British lord was about to enjoy the Port. But when Port tonging is used, filtering also assures that no little bits of broken glass get through, either. That would really put a damper on your evening! After that, the broken ends of both the bottle neck and the bottle are dipped in wax so they can be handled safely. You don’t want to get any blood on that nice, white tablecloth. The tonging method was developed because Port is one of those styles of wine that’s meant to age for a long, long time. Unfortunately, as wine ages, the cork used to close the bottle can dry out. A dry cork can crumble or shatter when you try to pull it out even with a really great corkscrew, and in the 18th century, corkscrews were still being developed and weren’t quite as good as they are now, so pulling out older, crumbly corks was even more difficult. 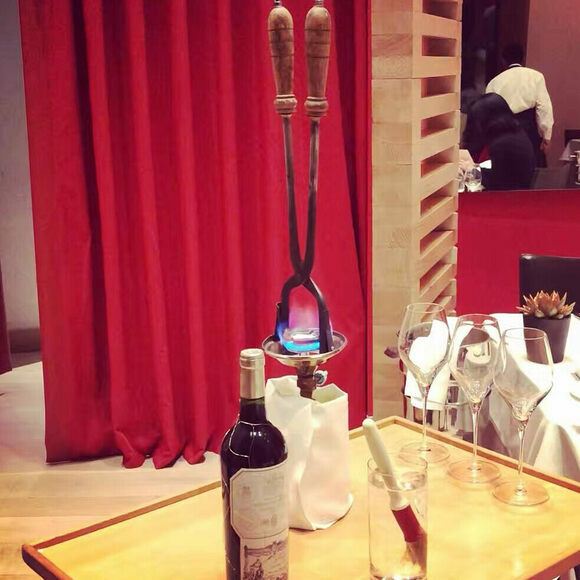 The Port tong method is still used at traditional restaurants in Europe, especially in Portugal where Port is made. But up until a few years ago, it was more of a relic of super-formal fine dining of days past. In recent years, as wine programs at modern restaurants find ways to differentiate themselves and keep diners interested, Port tonging has enjoyed a bit of a renaissance, led by New York’s Eleven Madison Park and their sommelier at the time, Dustin Wilson. Tonging is used there not just for Port, but for any bottle with some age on it or that the wine director wants to open with a little bit of fanfare. It’s all done at a beautiful table in the dining room so people can watch, and the wax used to seal the sharp edges of the glass turns the bottle into a souvenir for diners to keep long after their special dinner is over. If you want to try your hand at tonging yourself, Porttongs.com sells versions that are handmade in the United States. Just be careful. If you want to see Port tonging in action and done with a little modern flair, this is the place to do it.